Only one week til I head home for an extended weekend to celebrate Fourth of July with my family at the beach. It will be here before I know it but I have one more week of this session of grad school to make it through before officially checking out. 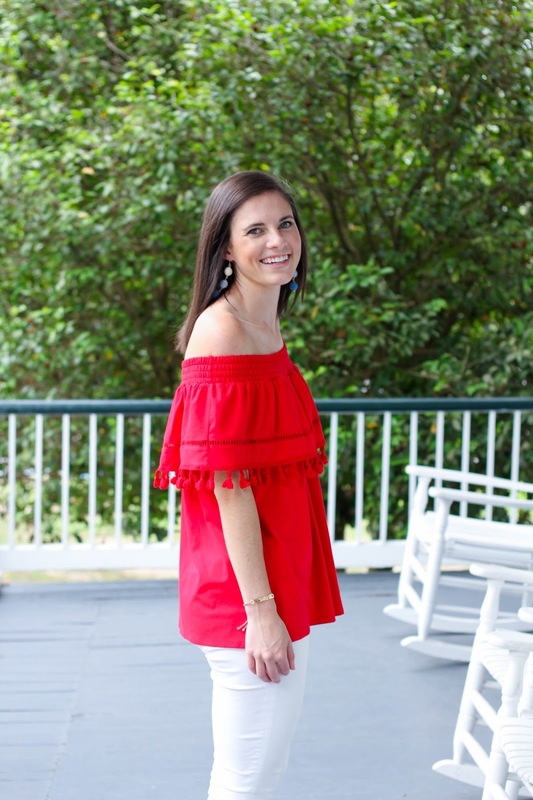 In the meantime, I'll be thinking about packing up fun and festive clothes perfect for the holiday weekend. With that in mind I figured why not share some outfit ideas with y'all as well. 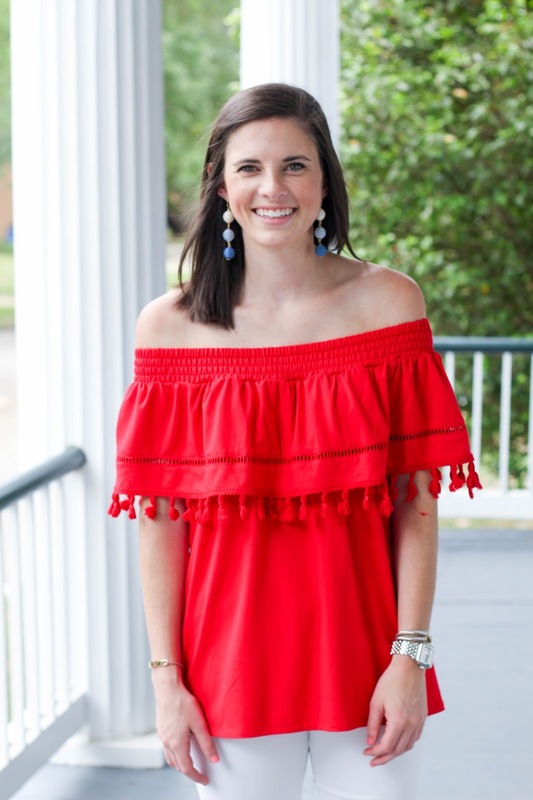 When it comes to dressing for holidays, especially the Fourth of July, I find it helpful to pair the colors together in a way that ensures that the the pieces can be worn separately for the rest of the season. 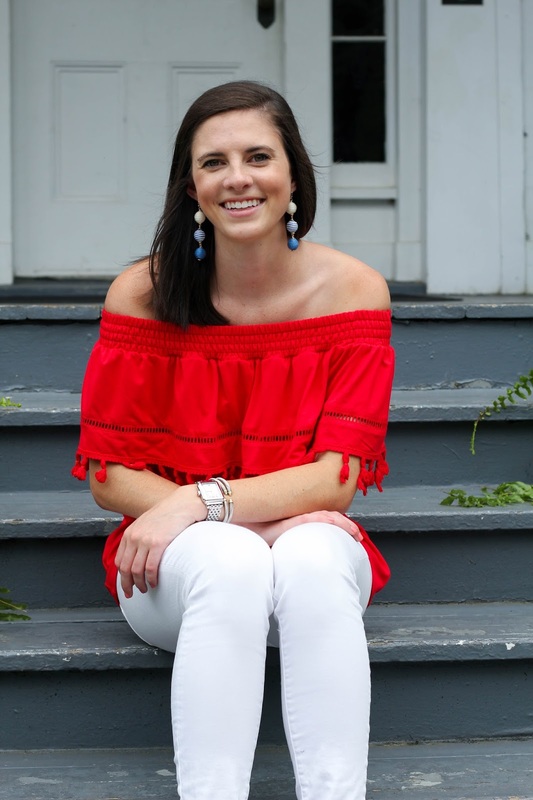 Earrings are a great way to add in that color that may be trickier to find in your closet. With the amount of blue and white I own for me, that color was red. 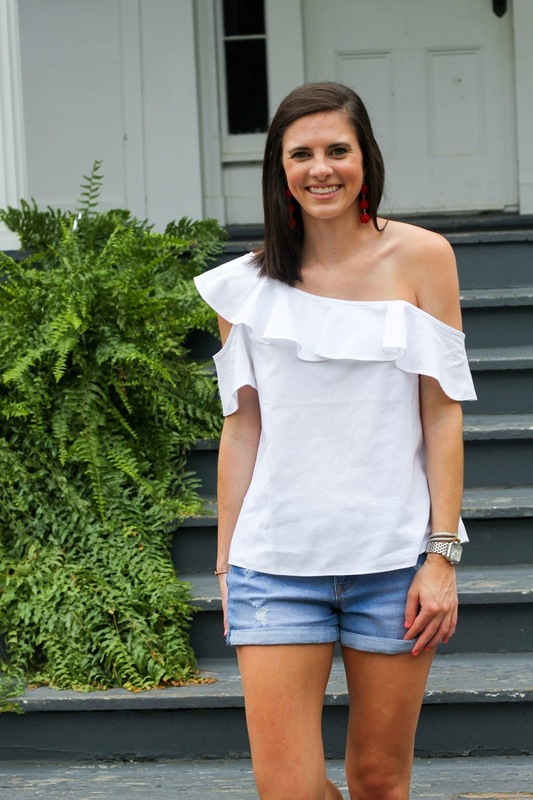 This first look is a bit more casual and would be perfect for any outdoor events you may have going on. 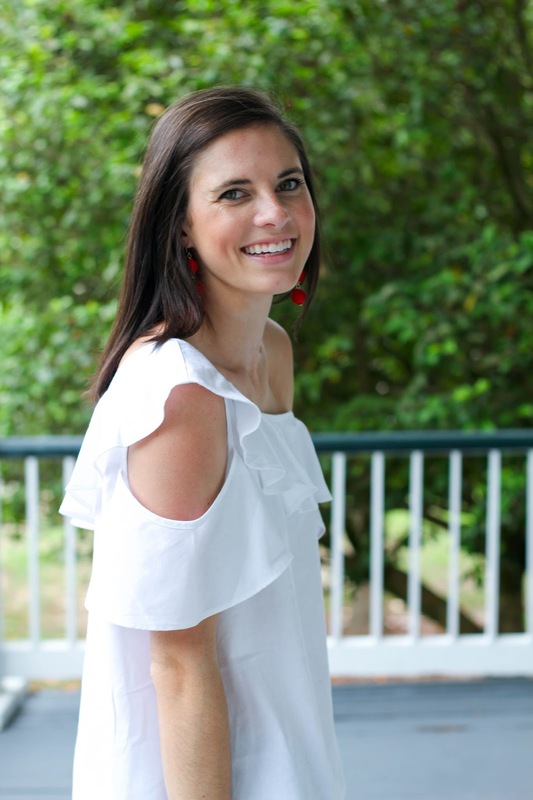 Ever since getting this white one shoulder top (available in blue and white stripe here) I find myself reaching for it all the time. The structure of it is so unique and the length is perfect for a pair of jean shorts. These jean shorts have been my go-to for a while now but I really want to try out this pair (how cute!?). 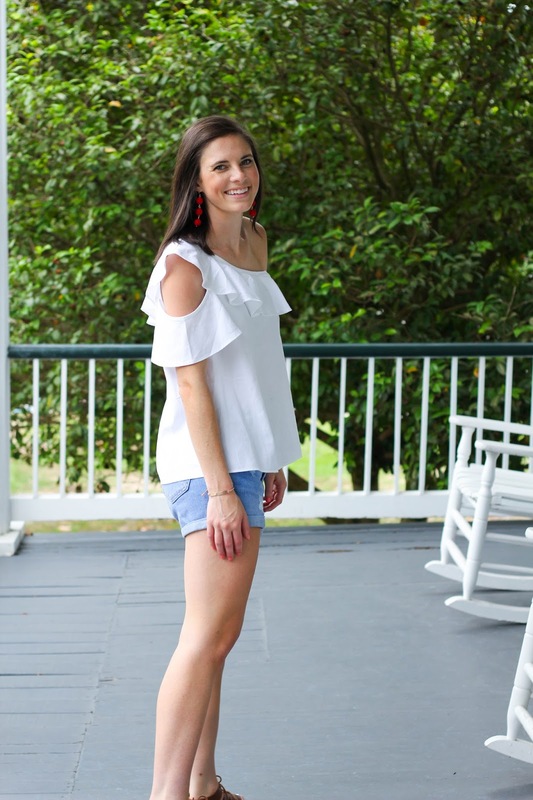 Maybe the fact that I'm from Alabama has me thinking about how this would fair in the heat of the summer but I am pleased to reassure you that handling the heat would be easy in this look. 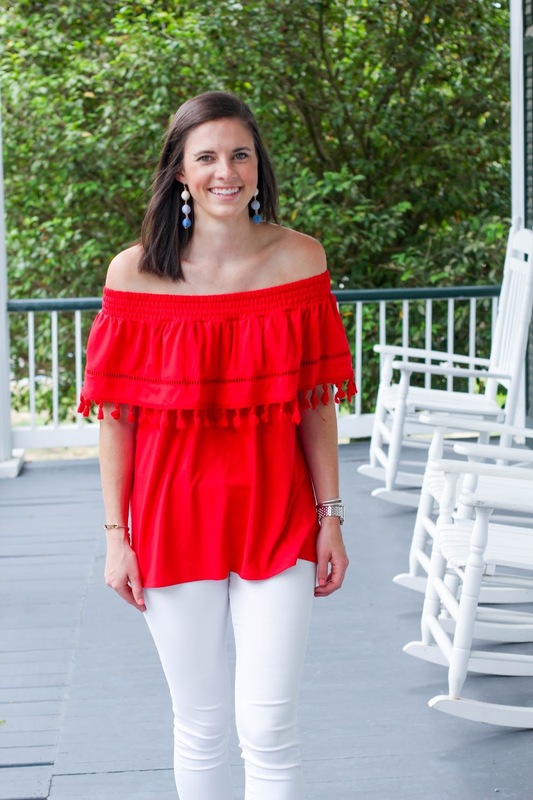 Since this top and pair of shorts is something I'd wear normally on the summer these red drop earrings add the Fourth of July flair I was looking for. 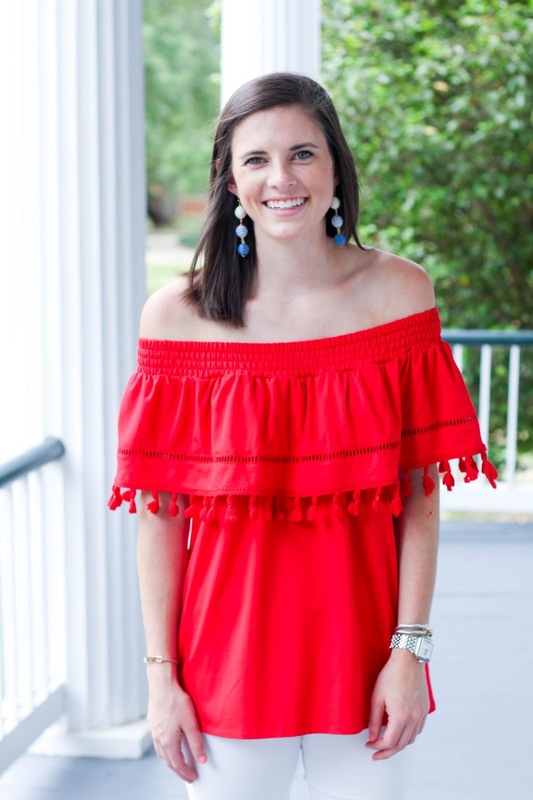 After some searching I finally found a fun red top to add to my collection. In my organized-by-color closet it kind of sticks out like a sore thumb since it is the only piece of red I own but I'm embracing it! This top also is probably one of the softest things in my closet as well. 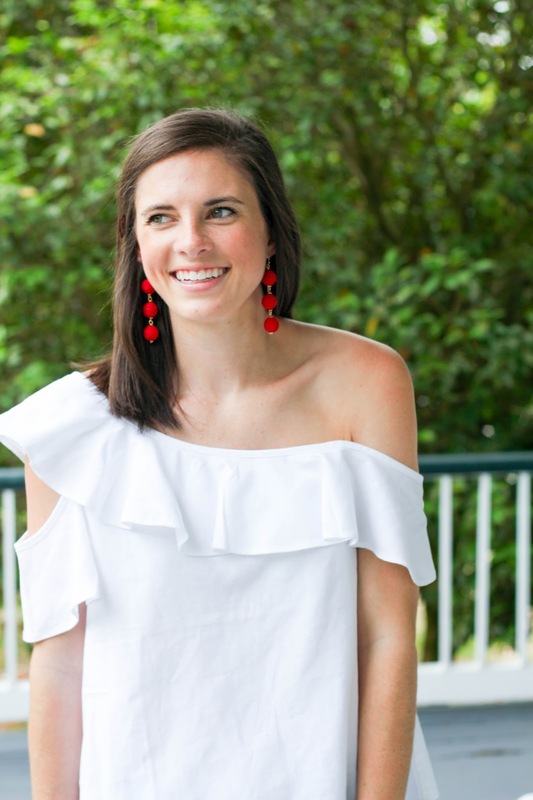 This second look is perfect for any of your dressier Fourth of July plans and ditch the earrings and you've got a cute dinner outfit at your disposal. 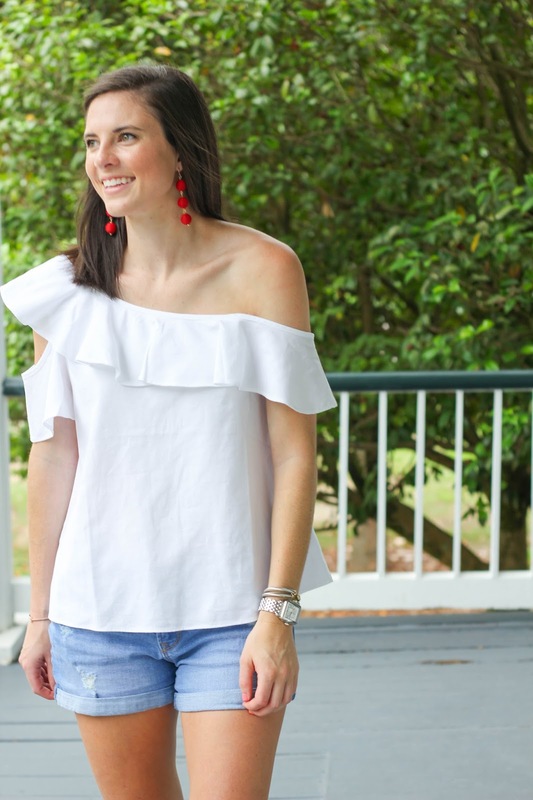 I was immediately drawn to the tassels on this top and y'all know I've been loving the off the shoulder silhouette. 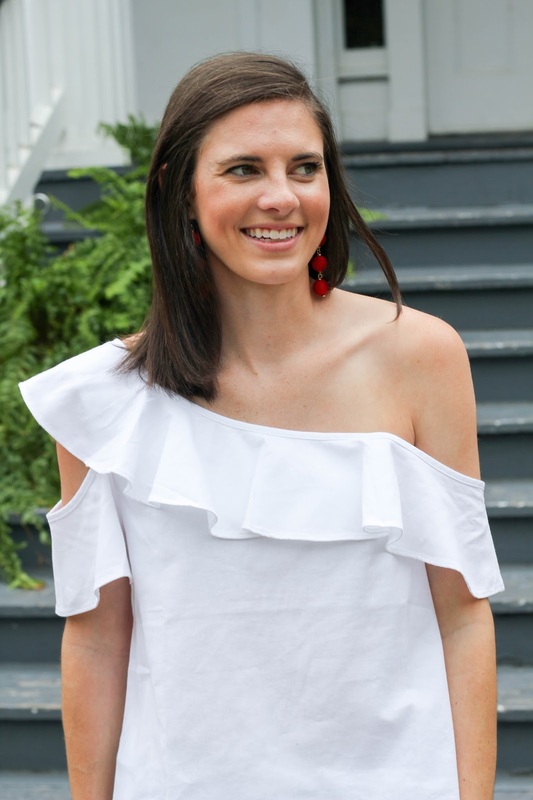 I love the pop it adds when paired with white jeans and the popover layer on it is a style I love. 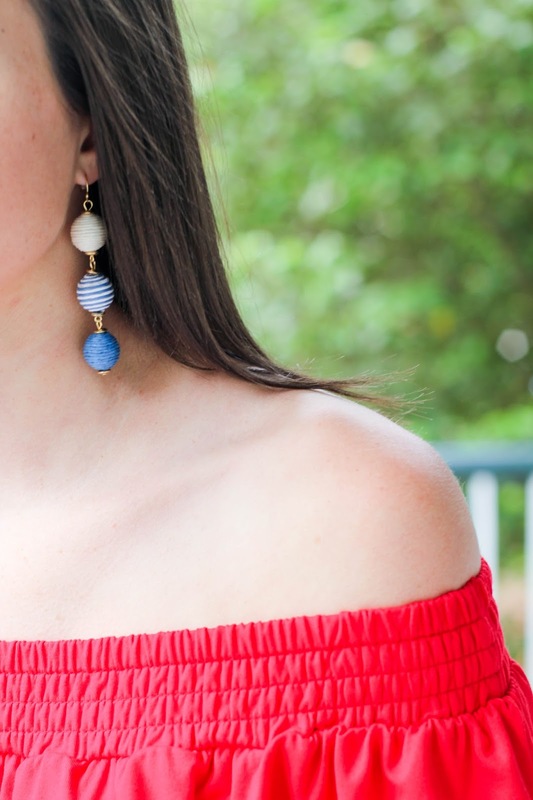 As for these earrings, how could I not choose them with my love of blue and white? 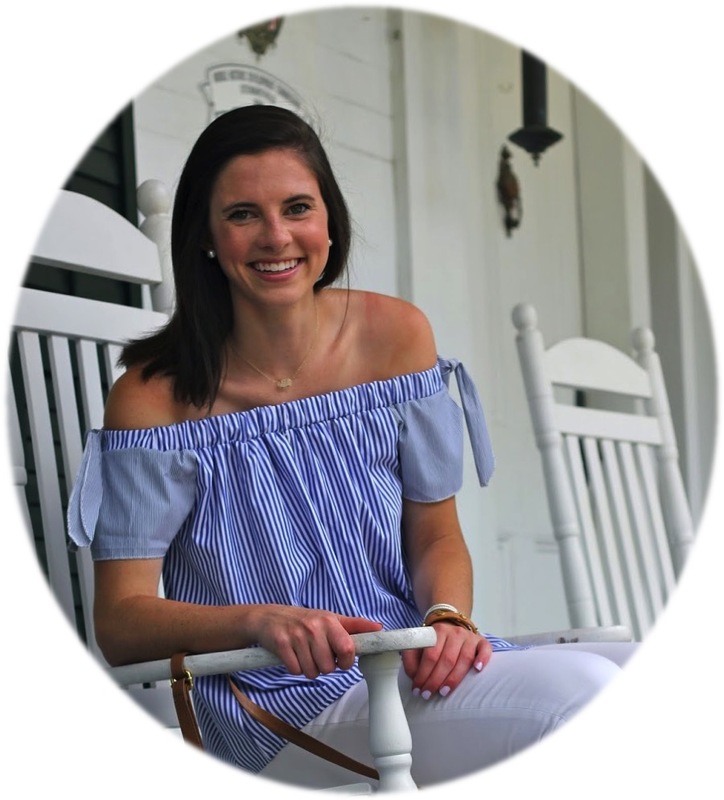 The striped one in the middle is so cute and these became the perfect patriotic piece to complete this outfit! With some everyday jewelry and a good pair of sandals I'm set! I like the first outfit - it's subtle and the earrings really add to it! 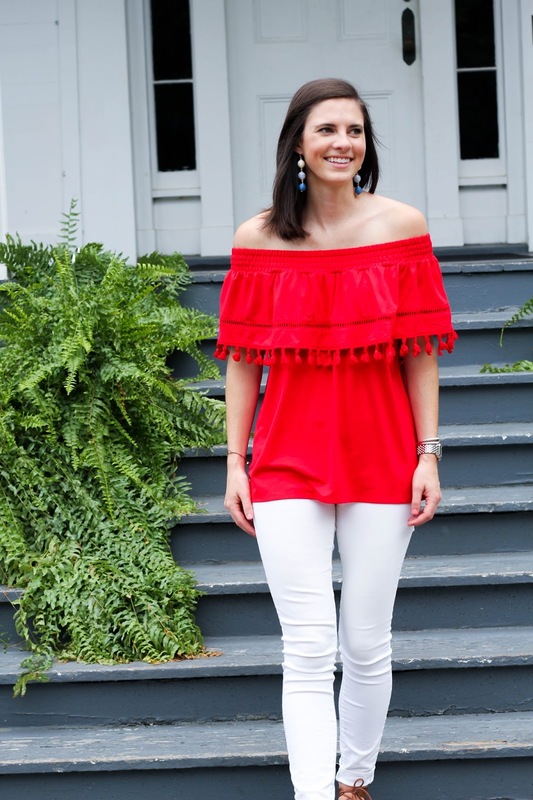 The red shirt is so vibrant and really pops against the white jeans. I have a similar top and you just gave me some outfit inspiration for the 4th! 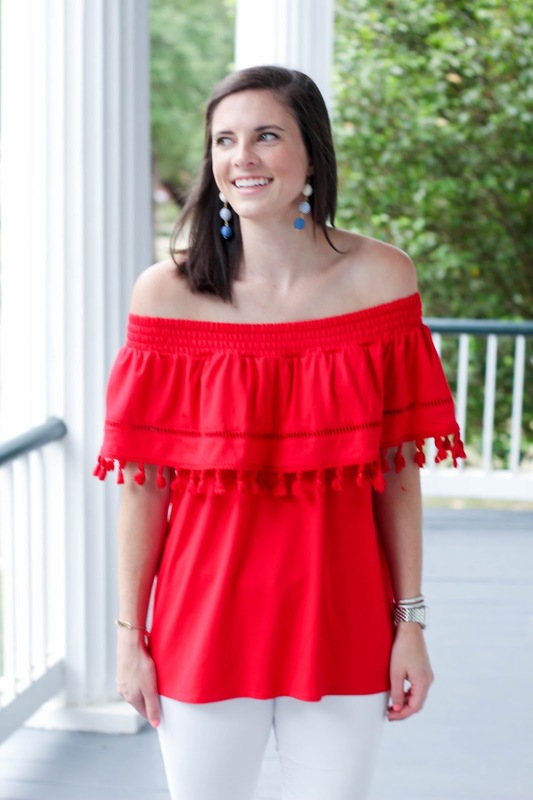 That red top is so fun & vibrant!! Cute! 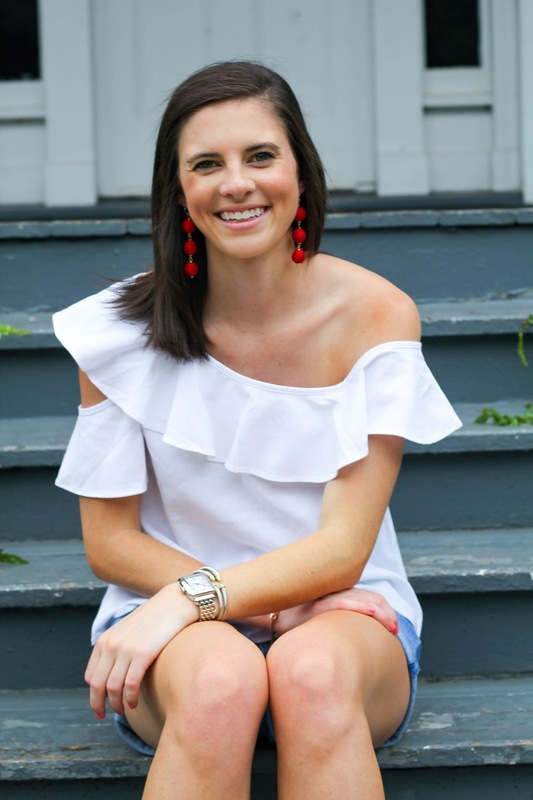 I'm loving the statement earring trend, it's one of my seasonal favorites!